I'm trying to communicate over text the Windows keyboard shortcuts. For the ones that use the Windows key, I don't want to type "Windows key +" each time. For non-techies on Facebook, use workaround seen on Wikipedia: ⊞ Win. Since you want to display the character on the Facebook where you have no control over fonts and there is no such character in Unicode at the moment, you can use mathematical operator Squared Plus (code point 229E) to imitate Windows logo as Wikipedia does in article on Windows key and in other keyboard-related articles. ⊞ Win+D shows the desktop (hiding even non-minimizable windows), or restores hidden windows when pressed a second time. ⊞ Win+Tab ↹ cycles through taskbar buttons. This key combination is reassigned in Windows Vista. I am doing it that way. As AFH mentioned, there are no Unicodes for modifier keys. You have two options: you can make use of the key available in certain icon fonts, such as Marlett1 or Wingdings, or you can use Win to symbolise the key. The latter option is the most commonly-used, especially inside of the industry, but since you say your audience is likely to be technologically illiterate, it would be more safe to go for the former. If you're using MS Word, you can insert the icon directly into your document. Select the Marlett font by typing it in or selecting it in the dropdown. In the Character code field, type 87, then press Insert. If you're using something other than Word, you can use Windows' native Character Map to copy the icon to the clipboard and then directly into the program you're using. Search for the Character Map in the Start menu's search bar. Once it's open, select the Marlett font from the dropdown. You should be able to notice the Windows key almost instantly, but just in case you can't, it has a character code of 0x57. 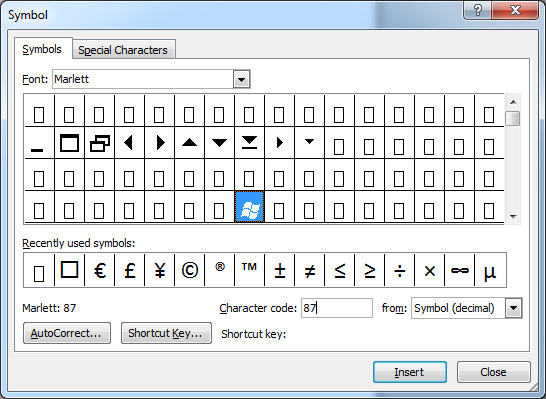 1 Conventional wisdom dictates using the Wingdings font for the Windows key, but this only includes the older, Windows 95-era version of the key, whereas Marlett uses the same version as the user's own edition of Windows. This is because Marlett is the font that the OS itself uses to draw its icons. Look for the "HoloLens MDL 2 Assets" font. It contains, not only the Windows key, but other useful system symbols as well. Mork is a new contributor to this site. Take care in asking for clarification, commenting, and answering. Check out our Code of Conduct. 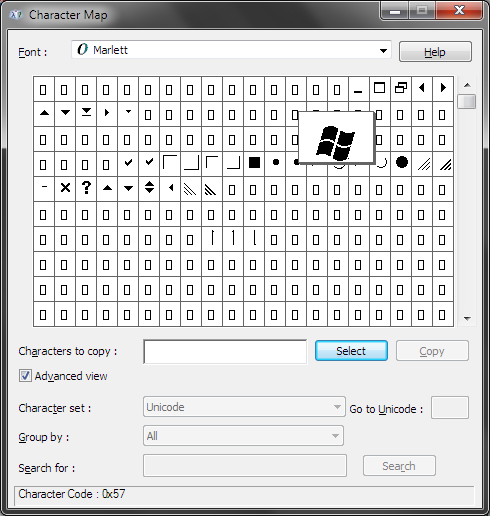 How to enter Unicode characters in the Windows Explorer (file manager) on Windows 7? In Unicode, is these a way to superimpose a character over another?